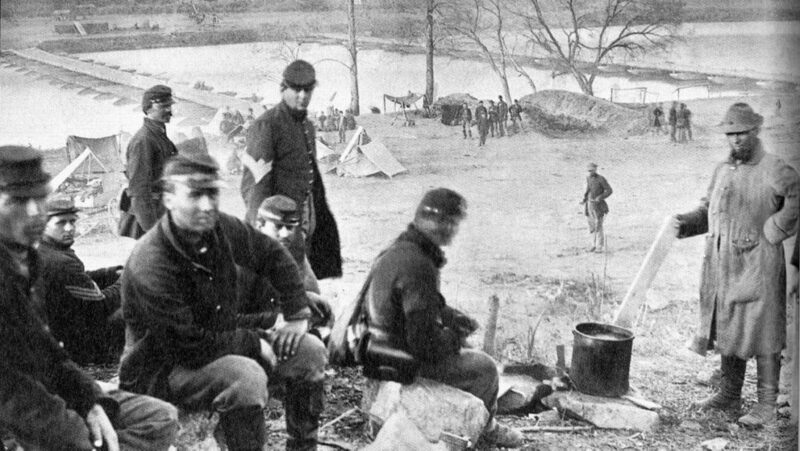 Irish in the American Civil War is fortunate to have Brendan Hamilton as a long-standing contributor to the site. Brendan’s painstaking research and analysis always makes for fascinating reading (see for example here and here). His latest piece is just as intriguing. 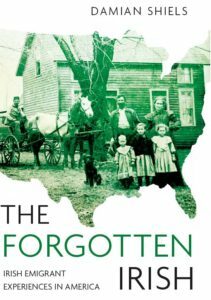 It follows the remarkable life of Irishman Felix Larkin, who during the Civil War served as an officer in 15th New York Engineers. But Felix was also a man of New York’s rough and tumble underworld of gangs. 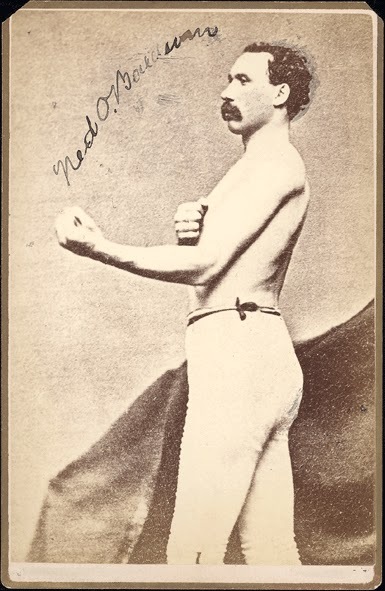 His was a life led facing legends such as Bill “The Butcher” Poole and the Bowery Boys. It was a lifestyle which would ultimately brought his end. Brendan brings us the details. “Frightful Murder.” Headline from the front page of the New York Evening Telegram, 25 Nov. 1868. * “Queer Bluffer. The keeper of a rum-shop that is the resort of the worst kinds of rogues, and who assists them in various ways.” Matsell: 71. 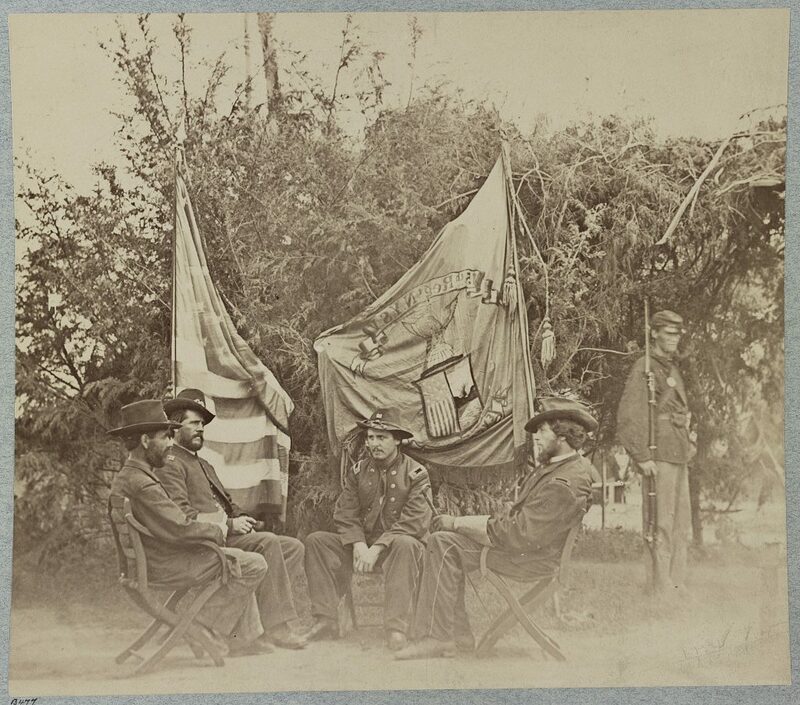 “15th Regiment Engineers, New York Volunteers, Civil War Newspaper Clippings.” New York State Military Museum. “15th Regiment, New York Volunteer Engineer Historical Sketch from The 3rd Annual Report Of The Bureau Of Military Statistics.” New York State Military Museum. 1855 New York State Census, New York, NY. 1860 US Census, New York, NY. Anbinder, Tyler. Five Points: The 19th-century New York City Neighborhood that Invented Tap Dance, Stole Elections, and Became the World’s Most Notorious Slum. New York: Simon and Schuster, 2001. Annual Report of the Comptroller. New York: E. Jones & Co., 1867. Asbury, Herbert. The Gangs of New York: An Informal History of the New York Underworld. New York: Alfred A. Knopf, 1928. “Assault and Robbery.” The Sun [New York, NY] 26 Sept. 1865: 4. Old Fulton NY Postcards Web. Jan. 2018. “Attempt by a Gang of Political Ruffians to Kill a Policeman–Arrest of Two of the Gang.” New York Daily Tribune 14 Jan 1856. Old Fulton NY Postcards Web. Dec. 2017. “Battle of Giants.” New Orleans Republican 5 Nov. 1868: 4. Library of Congress: Chronicling America Web. Jan. 2018. “Bloody Tragedy.” New York Herald 26 Nov. 1868: 5. Old Fulton NY Postcards Web. Dec. 2017. Bogan, Thomas. “Fraud Exposed!” New York Tribune 3 Dec. 1860: 1. Old Fulton NY Postcards Web. Dec. 2017. “Court of General Sessions.” The Sun [New York, NY] 23 Sept. 1859. Old Fulton NY Postcards Web. Dec. 2017. “Frightful Murder.” Evening Telegram [New York, NY] 25 Nov. 1868: 1. Old Fulton NY Postcards Web. Dec. 2017. 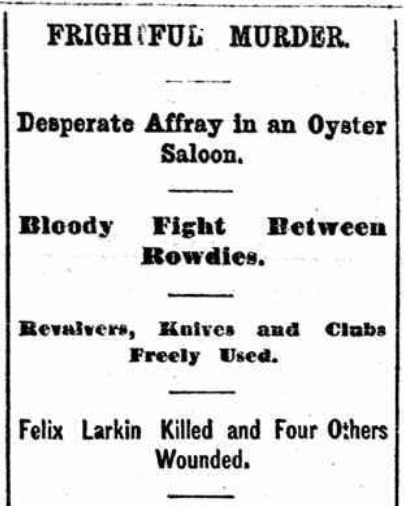 “Funeral of Felix Larkin.” New York Herald 28 Nov. 1868: 6. Old Fulton NY Postcards Web. Dec. 2017. Harding, William Edgar. The Champions of the American Prize Ring: A Complete History of the Heavy-weight Champions of America, with their Battles and Portraits. 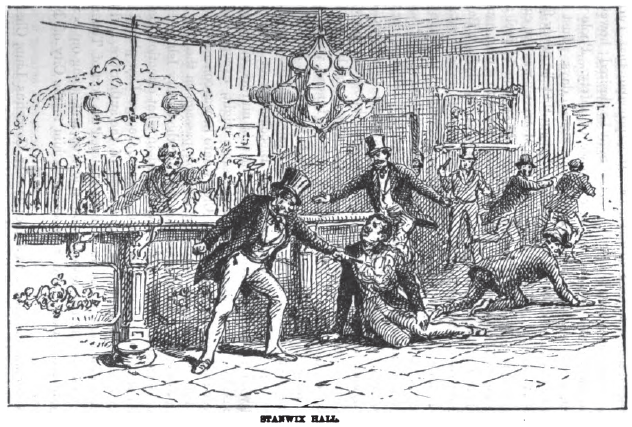 New York: Richard K. Fox, Proprietor Police Gazette, 1881. “Haul of Disorderlies.” New York Daily Tribune 24 Jan. 1856. Old Fulton NY Postcards Web. Dec. 2017. Mackowski, Chris and Kristopher D. White, “Before the Slaughter: How the Confederate Delaying Action in the Streets of Fredericksburg Set the Stage for the Bloodbath to Follow.” Hallowed Ground. Civil War Trust Web Jan. 2018. “Major Thomas Bogan Dead.” The Sun [New York, NY] 28 Jul. 1906: 10. Old Fulton NY Postcards Web. Jan. 2018. Matsell, George W. Vocabulum, Or, The Rogue’s Lexicon: Compiled from the Most Authentic Sources. New York: George W. Matsell & Co., 1859. “Military Excursions.” New York Herald 9 Oct. 1859: 6. Old Fulton NY Postcards Web. Jan. 2018. New York, Civil War Muster Roll Abstracts, 1861-1900 [database on-line]. Ancestry.com. Provo, UT, USA: Ancestry.com Operations, Inc., 2011. New York, Sing Sing Prison Admission Registers, 1865-1939 [database on-line]. Provo, UT, USA: Ancestry.com Operations, Inc., 2014. “The O’Baldwin and Wormald Mill–Putting Up the Stakes.” Daily Alta California [San Francisco, CA] 8 Oct. 1868. California Digital Newspaper Collection Web Jan. 2018. Redmond, Patrick R. The Irish and the Making of American Sport, 1835-1920. Jefferson, NC: McFarland & Co., 2014. 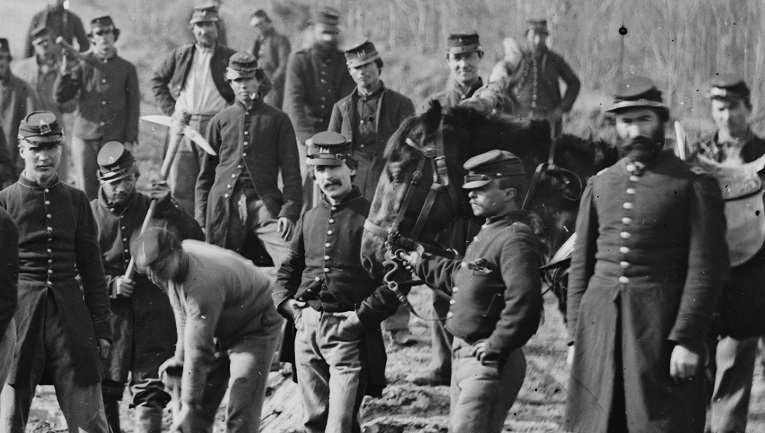 “Rosters of the New York Volunteers during the Civil War.” New York State Military Museum. Trow’s New York City Directory, 1855-68. “The Two Murders.” Evening Telegram [New York, NY] 27 Nov. 1868: 2. 10. Old Fulton NY Postcards Web. Dec. 2017. Valentine, D.T. Manual of the Corporation of the City of New York. New York: Edmund Jones & Co., 1865. Walling, George W. Recollections of a New York Chief of Police: An Official Record of Thirty-eight Years as Patrolman, Detective, Captain, Inspector and Chief of the New York Police. New York: Caxton Book Concern, 1887.